At the least, you'll get a good scare, at worst you could end up with a chainsaw through your face. Google kickback injuries to the face and you'll see what we're talking about. 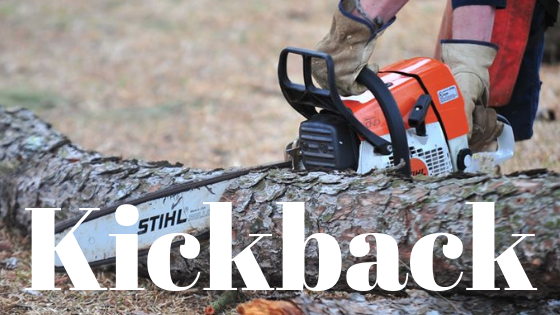 A kickback injury is something you want to wear and is clearly why any person with an iota of sense about personal safety will use some form of safety gear such as gloves or safety chaps when using a chainsaw. Even if at a minimum, it's a pair of safety classes. And personally, we would never use a chainsaw that didn't have a working chain brake which stops the chain from operating in a kickback moment. Those things save lives and limbs! In New Zealand, it's actually against the law to sell any chainsaw that does not feature a chain brake. There might be a few cheeky hobbits in New Zealand but they sure know a thing or two about product safety. The first is if the chain gets pinched between the material it’s cutting and causes the saw to drive backward into the operator. The second way is if the tip of the bar comes into contact with something solid (the ground, a log, a branch). This is the more dangerous form of kickback. When the tip of the bar hits that solid something at high speed, all the torque from the chain suddenly stopping gets transferred to the body of the chainsaw and the chainsaw wants to flip back at the saw handler, presumably with the throttle still held down. You begin to see where this is going, literally. Additionally, as the size of the guide bar’s nose increases, so does the potential risk for a kickback. So what is the science of a kickback? When you use a chainsaw it creates a 'reaction force'. If you are cutting on the lower half of the saw (closet to the base of the saw), the reaction force is pulled into the body of the saw, or the bumper spikes - this is what you want. When you are cutting with the upper half of the bar, the reaction force tends to act upwards toward the user. This is a transfer or momentum force. Hence, if something kicks, the saw is driven back towards the user because the force generated by the engine has to go somewhere. So how do you avoid a kickback from occurring? By staying focused on the job at hand. Using a chainsaw can be tiring work and after a hard session, you can find yourself with back muscles you never knew you had. Concentrate on where and how you are placing the top of the saw. If your arms are getting tired, your back is aching, perhaps it's time to take a break. If you follow good chainsawing practices, in particular being very careful where you place the tip of the chainsaw, you will greatly reduce the chance of a kickback occurring. The other half of the equation is to ensure that you wear adequate safety gear to protect from injury.